HP Envy Hands On: MacBook Pro Clone Better Than the Real Thing? It looks like a MacBook Pro. It feels like a MacBook Pro—aluminum body, chiclet keys, even a buttonless trackpad. But the Envy's got an HP logo etched onto its lid. And it might just be better. Don't act surprised that the Envy 13 and 15 have chiclet keyboards and buttonless multitouch trackpads because HP certainly isn't hiding the fact that they absolutely stole their look and ergonomics from the Macbook Pros. The $1,700 13-inch Envy isn't as powerful as the $1,800 Envy 15's mobile Core i7 processor, but it's more like a MacBook Air at just over 3 pounds, and its beautiful screen has been in my dreams. Neither are as strong as the MacBook Pro's unibody though—they're a bit more flexy, but if unibodies rated a 9, these would be a 7 or 8. The Envy 13 is almost more Air than Pro, at .8-inches thin and 3.74 pounds. (The Air is .76 inches thick and weighs 3 pounds.) Its screen, framed by the same style glossy black bezel as the unibody MacBook family, is absolutely stunning. Dubbed HP Radiance, the 410-nit display is apparently two times as bright as other LED displays and it looks it. Apple doesn't list the MacBook Pro's display brightness in nits, but the Envy's display definitely looked brighter and clearer. It pulls the dual processor trick the 13-inch Pros don't, with switchable ATI Mobility Radeon HD 4330 graphics and an Intel ultra low voltage Core 2 Duo processor inside. Its removeable battery promises 7 hours of battery life, however its add-on extra battery is sweet: It magnetically clips to the bottom of the notebook to make it look like it is part of the actual build. HP promises 18 hours of juice with that thing clipped on. Did I mention it has Dr. Dre's fingers all over it with Beats Audio integration? Where the Envy 13 leaves off in performance the Envy 15 picks up. The 15.6-inch version looks pretty similar to the 13, but is laser etched all around (on the palmrest and the lid) and lacks the flush glass display with the high-quality Radiance technology. But it'll outperform pretty much any other laptop out there so far, since it'll have Intel's next generation mobileCore i7 processors, ATI Mobility Radeon HD 4830 graphics and support for up to 16GB of RAM. The beast will also have two hard drive bays, which you can fill with SSDs. But it's still only an inch thick and 5.18 pounds, making it that much more impressive. Both will be available on October 15, though it's probably worth waiting the extra week for Windows 7. PALO ALTO, Calif., Sept. 15, 2009 – HP today redefines the premium notebook PC experience with the introduction of the HP ENVY sub-brand, which offers customers precision-crafted, high-performance models featuring HP Metal Etching and concierge service and support. The new HP ENVY 13 boasts the brightest display in its class, and the HP ENVY 15 is the company's fastest consumer notebook PC ever. "HP ENVY includes the latest in materials and technology inside and out and pushes the technological and performance boundaries of what can be done in sleek, powerful and lightweight notebook PCs," said Ted Clark, senior vice president and general manager, Notebook Global Business Unit, Personal Systems Group, HP. "Discerning consumers will get a premium experience and performance." With HP ENVY, the focus is on designing an entire premium experience to satisfy the most demanding customers – from the products to the packaging to the service and support. for today's music and available exclusively on the HP Envy: Beats Audio. Envy users will feel the music – not just listen – and enjoy music the way the artist intended. The ENVY 13 balances style and substance. Carefully crafted details inside and out will satisfy the cravings of demanding mobile customers. percent color gamut (versus standard 45-60 percent), photos appear richer with amazing color depth. Additionally, with fast 8-millisecond response time, customers can view movies with TV-like performance. further sets the PC apart from others, and a VGA webcam(3) optimized for low light also is included. 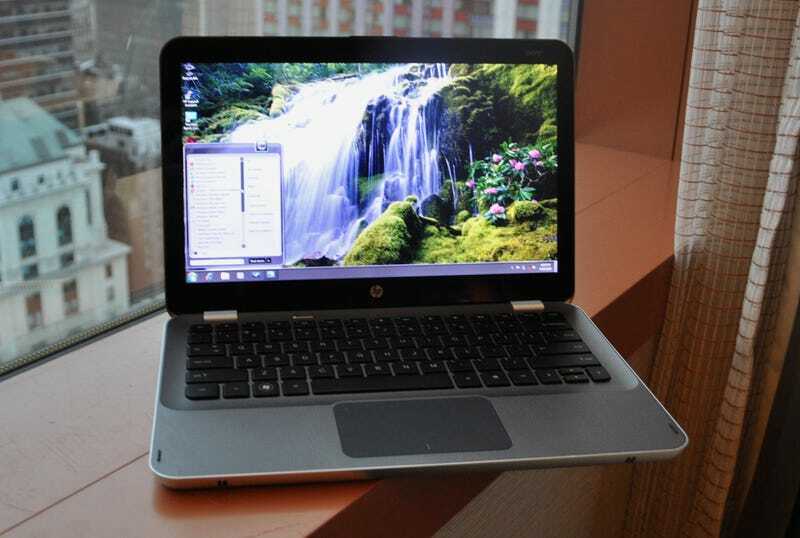 HP placed the same focus on design into its optional Slim Fit Extended-Life Notebook Battery. Taking the form of a "slice," it preserves the sleek look of the ENVY 13 while giving users up to 18 hours of battery life with the extended-life battery. (2) The standard battery is user-replaceable. ATI Switchable Graphics technology dynamically switches between ATI Mobility Radeon™ HD 4330 discrete graphics and the Intel® integrated graphics processor for either high-powered graphics processing or low power consumption for long battery life without booting the notebook. The Intel Core™ 2 Duo processor provides the power of dual processor cores while delivering extended battery life when the notebook is unplugged. organized and the adapter from slipping off a slick surface. An optional HP USB Ethernet Adapter also is available. lightweight durability in a 1-inch thin, 5.18-pound package. (1)Customers have maximum speed and mobility with the future Intel Core i7 processor(4) and up to 16 gigabytes (GB) of DDR3 1,066-MHz system memory in four SODIMM memory slots. Versatile storage options include the ability to add two solid-state drives in a RAID-0 configuration to improve the overall speed of the ENVY 15 while providing excellent disk performance. Creative users will appreciate the ENVY 15 notebook's performance and full versions of Corel® Paint Shop Pro® Photo X2 and Corel VideoStudio® Pro X2 for creating photo and video content. Power users and gamers can take advantage of premium graphics performance via ATI Mobility Radeon HD 4830 graphics with 1 GB of dedicated video memory for visually intense applications, DirectX® 10.1 games and highdefinition video playback. notebook in this class. A Nightvision VGA webcam that is optimized for low-light or zero-light conditions is standard on the HP ENVY 15, incorporating an infrared LED that assists the webcam(3) by providing the necessary illumination in dark environments. • HP Clickpad integrates the buttons into the touchpad and allows for fluid movements, while also allowing users to disable the clickpad if desired. • The keyboard's direct-action keys (versus typical function keys) allow users to quickly access often-used commands such as print and volume adjustment. • Minimal desktop clutter and trial software adds to notebooks' simplicity. • An optional external optical drive complements the ENVY design and gives users the flexibility to carry the extra weight only when necessary. Two USB ports also transform the drive into a dock for additional capability. • The ENVY 13 and 15 are presented in streamlined paper carton boxes using minimal ink. Included in the packaging is a simplified setup poster and documentation contained within an SD card. as next-day shipping for hardware customer service. The HP ENVY 13 and ENVY 15 are expected to be available in the United States on Oct. 18 with a starting price of $1,699 and $1,799, respectively. (5) Register for availability notification at www.hpdirect.com/go/newfromhp. Additional information about HP ENVY is available at www.hp.com/go/ENVY.